Rally For Our Rights – BACK TO BOULDER! Enter our “Mystery Giveaway” to help fight Boulder’s Assault Weapons Ban! Winner will be announced within 24 hours of the rally! CLICK HERE to enter and learn more! On May 15th, 2018 Boulder City Council passed an overreaching and oppressive “assault weapons” ban. This ban does nothing to address public safety, but instead turned thousands of law abiding citizens into criminals themselves. And we are not happy! Hundreds of gun rights supporters have already taken to the streets of Boulder prior to the passage of this ban – and now we’re going back! Join with your fellow Second Amendment supporters at “Rally For Our Rights – Back to Boulder” – a demonstration in support of the Right to Keep and Bear Arms! This will be a non-permitted event exercising our First Amendment right to protest on public sidewalks and the public park. There will be no speakers or set agenda. We will be lining Broadway St at the intersection of Canyon Blvd near Central Park (which can be used as overflow if needed). We will carry flags, banners, and signs. – Signs, lots of signs! 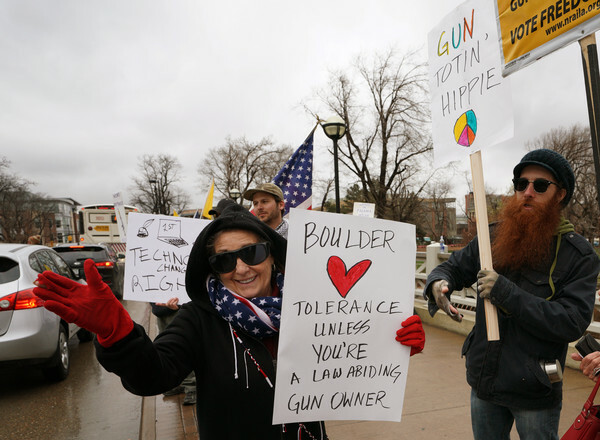 Focus on the issue at hand in Boulder, the gun ban and how it has affected law abiding gun owners! – Banners and signs supporting gun rights and the 2nd Amendment. This is a single focus/issue event with participants from various political parties and with differing ideological beliefs. Please be respectful and courteous to your fellow Second Amendment supporters. We will meet at the corner of Broadway St and Canyon Blvd, near the Bandshell, and spread out from there. There are several parking structures downtown for parking as well as on street parking all over downtown. Feel free to share this invitation with your friends and other interested parties. It’s time to fight back and make our voices heard. We hope to see you there! What’s next with the ban? Within 24 hours a lawsuit was filed suing virtually the entire city government from the mayor and city manager to the city council and chief of police as defendants, arguing the ordinance violates not only the state and U.S. Constitution but also at least two Colorado statutes.